I’ve decided to start sharing with you guys my favourite blogs because there are so many brilliant ones out there which I think deserve to be well known. I’m going to be posting three of my favourite blogs every month or couple of weeks to maybe help you find some new ones, because I always love finding blogs but struggle to find ones that post things similar to me. They may be blogs with thousands of followers or with just a few hundred, they’re simply ones I adore. A quick obvious point, all the photos are obviously not mine, they belong to the blogs I mention, I have simply printscreened to give you guys a preview! So let’s go! 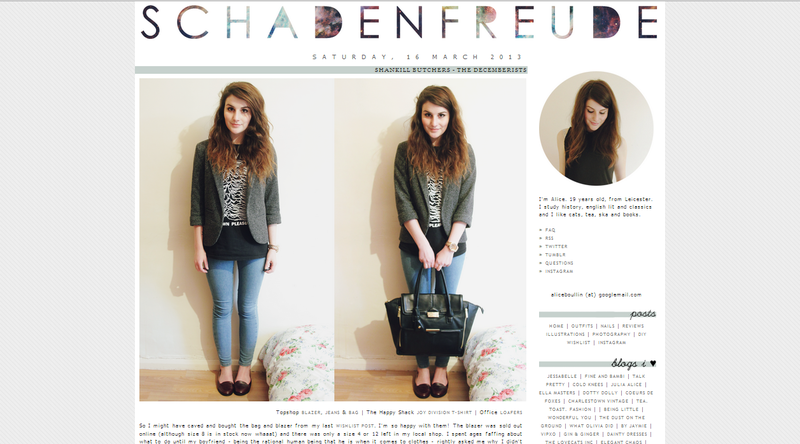 First up has to be my all time favourite blog: SCHADENFREUDE. I’ve been following Alice ever since I started blogging, before I stopped and started again and I just adore everything about her blog. She does so many OOTD’s which inspire me a lot, but also occasionally some reviews and posts about her recent purchases. 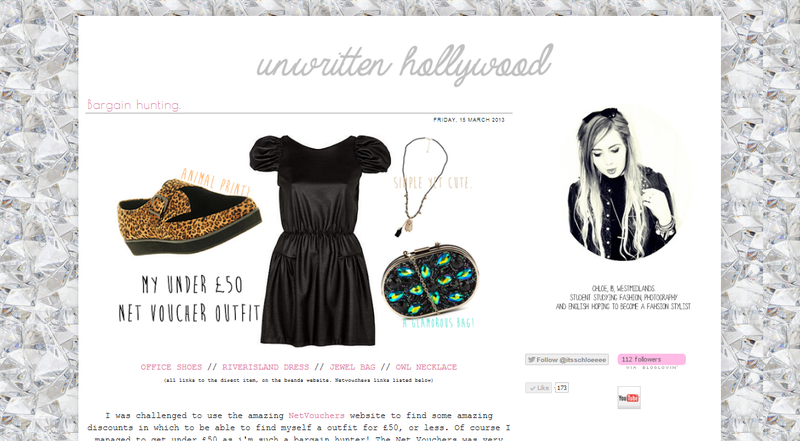 Her layout is brilliant and she is certainly my most visited blog. Second is Chloe at UNWRITTEN HOLLYWOOD. I’ve also been following Chloe for a while and I love her OOTD posts. She posts very frequently which I always like in a blog. I would say her blog is mainly fashion but she does occasionally post a few beauty reviews which is great. 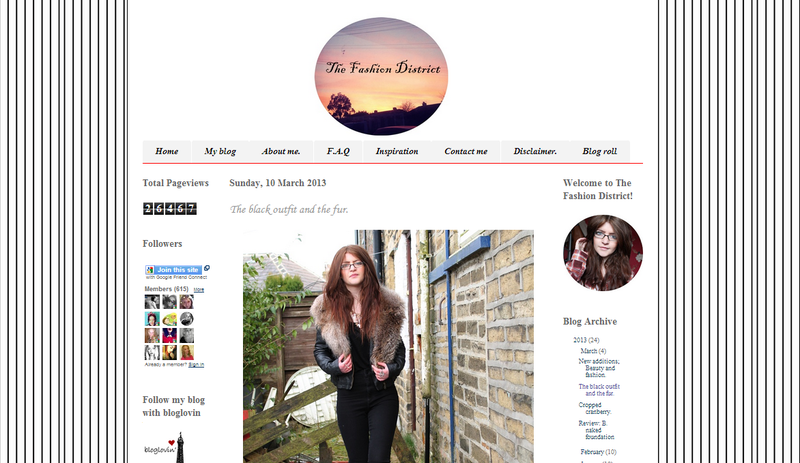 Her blog is pleasing to the eye too! Lastly is Nicola at THE FASHION DISTRICT. Another blog I’ve been following for absolutely agesss. As you can probably tell from her blog name, she posts fashion, mostly OOTD’s and a few purchase’s posts. I’m in love with Nicola’s style, she always posts the recent trends with high street fashion which I find great considering I can’t afford much else. So that’s it! My first blogroll. Hopefully you’ve found this helpful and you can enjoy the blogs that I do! Comment below and let me know what your favourite blogs are and drop me your link so I can check them out!